field-based program appropriate middle school and high school students. It contains background information, lesson ideas, procedures, data collection and reporting forms, suggestions for interpreting the results and extension activities. Parents, teachers, students and not-for-profit environmental educators are welcome to download the Water Quality Testing Manual free of charge. Please note that this program tests the environmental quality of water bodies, not the potability of drinking water. Teachers in MWRA communities may borrow a Water Quality Testing Kit from MWRA. The kit contains equipment for testing temperature, pH, Dissolved Oxygen, Biochemical Oxygen Demand, Nitrates, Total Dissolved Solids and Salinity, Turbidity and Total Coliform Bacteria. In order to borrow a Water Quality Testing Kit, teachers must attend a full-day workshop. If you would like more information about the kit or the workshop, please contact Meg Tabacsko, (617) 660-7975. © 1998, 2008 by the Massachusetts Water Resources Authority. 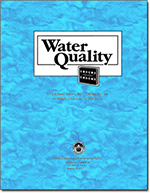 "Water Quality, A Field Based Water Quality Testing Program for Middle and High Schools" may be freely copied and distributed for educational purposes. It may not be sold, transmitted or distributed for profit. Why is Water Quality Important and What Factors Affect Water Quality?